What Should the Flyers Do At This Point in the Season? After last night’s overtime loss to the Penguins, the Flyers are officially on an eight-game losing streak. The Flyers’ record over that eight game stretch is 0-3-5. The worst part of this stretch is that they’ve been in control for most of these games but somehow find a way to lose in the end. Take last night’s game as an example. The Flyers were up 3-1, then 4-3, then lost 5-4 in overtime. It’s good in a way that the Flyers found five points in an eight game skid, but when most of those games were winnable it makes it hard to swallow. Dave Hakstol has been trying to remedy the situation: he’s juggled lines, he’s switched goaltenders, he even called up a high-scoring prospect from the AHL but nothing seems to have worked. The only line that has stayed in tact and produced for this team is the first line: Claude Giroux, Sean Couturier, and Jake Voracek. Flyers fans everywhere have been calling for Hakstol’s head, but I don’t think that he’s the problem right now. The other nine forwards that start for Hak are simply not producing while the top three forwards are playing outstanding hockey. Coots is one goal shy of his career high just 24 games into the season, Claude Giroux is on pace to score over 80 points this season, and Voracek is on pace to set a career high in points. Hakstol’s system is clearly working for the top line; what’s the problem with the other three? I think the Flyers have always been a team that overachieves. They play better than their talent level actually is and that is finally catching up to them. There is a lot of promising young talent on this team. Guys like Nolan Patrick, Travis Konecny, and Jordan Weal all show the ability to be 80+ point scorers but just appear to be stuck in the mud right now. Konecny has the most NHL experience at 94 games over two seasons. These guys have plenty of time to flourish into good players, and prove they aren’t just a team that overachieves. I trust that they can do so in Hakstol’s system. Mix in role player type players like Scott Laughton, who is a Mike Richards incarnate, and Taylor Leier who has shown some promise, and this is a team with a lot of upside. If you take it one step further, the Flyers have a lot of talent at the AHL level as well, guys like Danick Martel, who was just called up, Oscar Lindblom (remember him? ), and Mike Vecchione are available and have shown flashes. If you go even deeper than that the Flyers have a couple high draft picks at the Junior level as well. German Rubstov, the first round pick from 2016, and Morgan Frost, the Flyers 27th overall pick in the 2017 draft are still with their Junior teams. Both guys are young players that the Flyers are very high on. Taking all of those things into consideration, I don’t think that cutting ties with Hakstol is the right thing to do at this point in time. My solution for the Flyers? Shop Wayne Simmonds. I know, it’s an incredibly unpopular opinion, but I would be okay with trading Wayne Simmonds for the right price. 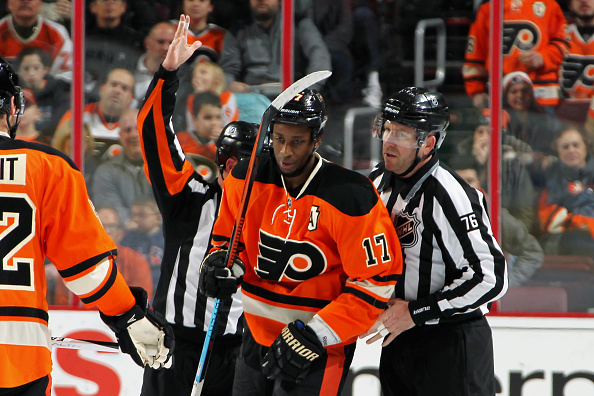 For one, Simmonds is in the midst of a down year. He currently sits at 14 points (seven goals, seven assists) and is on pace for under 45 points which would be his lowest since the 2012-2013 season. The former All-Star is the textbook definition of a power forward and still has a lot of hockey left in him. What makes him even more valuable than his willingness to stand in front of opposing goaltenders is his cap hit, only 3.98 million. Ron Hextall loves to trade [hell, he just traded Brayden Schenn, who’s on pace to break 100 points for the Blues, for what would become Morgan Frost, Jori Lehtera, and a future pick]. While that is a tough pill to swallow for now, I think he could get a haul for Simmonds. We’re talking high draft picks, young talented prospects, or even first or second year players with upside for a forward who may have hit his peak. Ideally the Flyers need a true goal scorer, something that has been lacking from this team for what seems like an eternity. If that can be found in a trade for Simmonds that would be the perfect situation. Keep in mind, I love Simmonds. He embodies what it means to be a Flyer by a lot of fan’s standards, but if the team has the chance to get younger and better at the cost of a 30-year old forward who is at his prime I would do the deal in a heart beat. And he may be the only guy, save Giroux, who could land a haul for the Flyers.